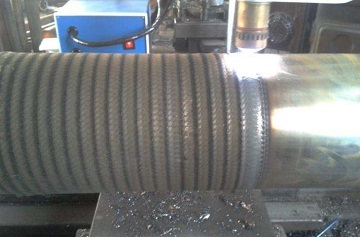 Hardfacing by weld overlay for a oil drilling pipe (plasma welding). Hardfacing, literally speaking, means to harden the surface of the metal. It is a typical surfacing form through which a hard, wear-resistant material is deposited onto the base metal (substrate) by either weld overlay or thermal spray process. Hardfacing is appied for the purpose of reducing wear or loss of material by abrasion, impact, erosion, galling, or cavitation. Depending on the properties of specific deposited materials, hardfacing may also impart corrosion resistance to the surface that is not intrinsic to the underlying base metal. From the prospective of production process, hardfacing can be classified as weld overlay and thermal spray. The weld overlay hardfacing refers to true welding processes, in which the filler metal and a small amount of the base metal are molten and are bonded metallurgically. Such welding processes include oxyfuel gas welding (OFW), plasma arc welding (PAW), submerged arc welding (SAW), open arc welding (OAW), shield metal arc welding (SMAW), gas tungsten arc welding (GTAW/ TIG), and laser welding. Generally, the weld overlay hardfacing produces hard and relatively thick coatings with excellent bonding between the hardfacing material and the base metal. Usually, the weld overlay hardfacing involves a buildup process, which refers to the addition of weld metal to a base metal surface for the restoration of the component to the required dimensions. The buildup alloys are not designed for wear resistant but to return the worn part back to, or near, its original dimensions or to provide adequate support for subsequent layers of true hardfacing metal. 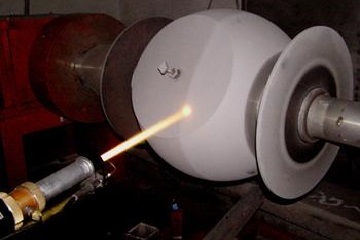 The HVOF thermal spray of tungsten carbides on a valve ball for hardfacing. The thermal spray hardfacing comprises a group of processes in which divided metallic or nonmetallic material is sparyed onto a prepared substrate to form a coating. The sprayed material is originally in the form of wire, rod, or powder. As the coating material are fed through the spray unit, they are heated to a molten or plastic state and propelled by a stream of compressed gas onto the substrate. As the particles strike the surface, they flatten and form thin platelets that confirm and adhere to the irregularities of the prepared surface and to each other. They cool and accumulate, particle by particle, into lamellar, castlike structure. Compared to weld overlay hardfacing, the thermal spray processes are mainly applied for a thin and hard coating with minimum work distortion while there is a purely mechanical bond between the harfacing material and the base metal. Generally, there are 5 thermal spray processeses available: oxyfuel wire spray, electric arc wire spray, oxyfuel powder spray, plasma arc powder spray, and high velocity oxyfuel (HVOF) powder spray. The weld overlay hardfacing materials include a wide variety of alloys, carbides, and combinations of these materials. They can be grouped into five general categories such as buildup alloys, metal-to-metal wear alloys, metal-to-earth abrasion alloys, tungsten carbides (which are applied for extreme metal-to-metal or metal-to-earth sliding and cutting wear), nonferrous alloys. The wear- or abrasion-resistance performance of hardfacing materials are primarily determined by the hard phase precipitates such as borides, carbides, or intermetallics. 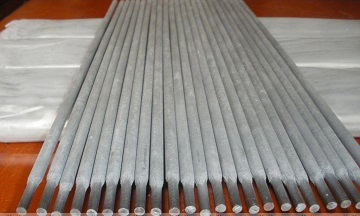 The weld overlay alloys (filler metals) can be furnished in the product form of bare rods, flux-coated rods, solid wires, tube wires, or powders. They are available in iron-base alloys, carbides, cobalt-base alloys, nickel-base alloys, high-silicon stainless steels, and copper-base alloys (aluminum bronze). The thermal spray coatings (hardfacing) provide the solution to many mechanical, electrical, and corrosion reisistance problems involving metal parts and assemblies. The thermal spray HF materials also encompass an extremely wide range of pure metals, metal alloys, cermets, ceramics, carbides, polymers, nickel-aluminum and nickel-graphite composites. Different material selection may result in different characteristics of toughness, coefficient of friction, hardness, and other properties. The hardfacing technique is developed primarily for two reasons: dimensional restoration, and wear/abrasion resistance. It finds extensive use in petrochemical & chemical industry, mining, steel industry, power plant, valve engineering, and marine industry. Hardfacing is typically applied for controlling abrasive wear, such as that encountered by mill hammers, digging tools, extrusion screws, cutting shears, parts of earthmoving equipment, ball mills, crusher parts, rock/coal pulverizer, valve seating surfaces, undercarriage parts of tractors, high-performance bearings, auger flights, shovel teeth, rock drill bits, dies and rolls in steel industry, and pump parts.